The staging for Red Bike is very simple. When the audience enters, the Caplan Studio Theatre offers a small, bare stage space with seating on three sides. On the fourth side is a minimally raised platform adorned with fake grass and tiny flowers, setup for two musicians. Live music runs throughout the production and injects additional energy into the performance as Jordan McCree and Andrew Nittoli provide percussion, keyboards, and strings. Because the space is small, the actors do not require microphones to project their voices. An interesting decision regarding their sound is one that occurs about midway through: the three actors each choose one part of the audience to stand in front of as they recite a list of things their younger selves wanted to be when they grew up. When this happens, you can only hear what the actor directly in front of you is saying, leaving you to wonder what the others’ dreams might have been. It is a unique effect that could not have been achieved in a difference space. Because there are no props or set pieces, modern dance movement offers the only representation of the titular bike and recurring items like drones or a fork. The stage remains empty throughout the production, so the actors balance themselves on one leg, arms thrown wide when they are riding their bike. They trail their fingers delicately through the air when they talk about stocks, bonds, and derivatives. These interpretive movements breathe life into the production by breaking up the roughly 70 minutes of pure dialogue, as well as helping the audience keep up with the story by visually identifying recurring ideas. The lighting design is effective at keeping all of the actors properly lit while also conveying the mood of the dialogue when appropriate by spilling blue or red light across the stage. There is a section of the play during which the actors begin entering and exiting the space in turn, and the lights dim and flash more aggressively, infusing additional energy to the physical movement. The themes of Red Bike are all too applicable to the world we find ourselves in today. Social issues and economic divide wind their way throughout the narrative. Told through the eyes of an eleven-year-old child, the play offers a sharp indictment of consumerism in America, and poses questions about lower- and middle-class families and what it means to dream of having more. The play gives children more credit than adults often do; proving they are keenly aware of the world around them and of their place in it long before we might wish. 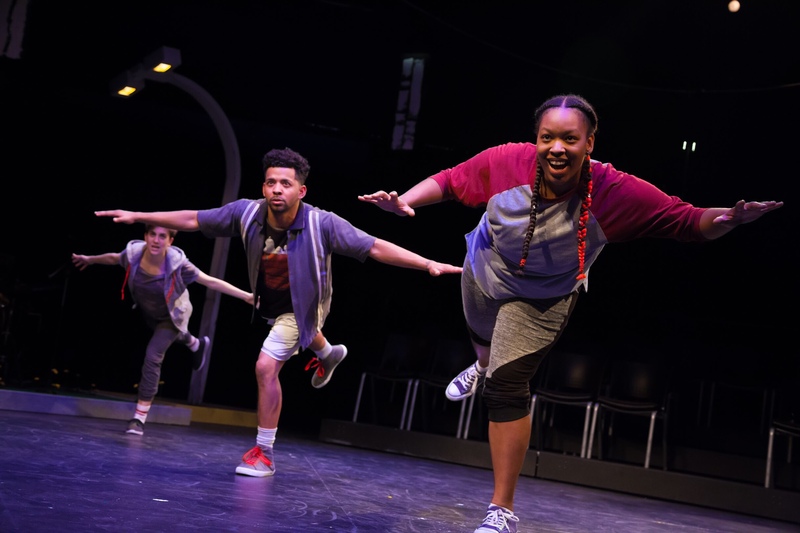 Svich’s play also offers a glimpse of what it means to live in a small town where the economy is failing, gentrification is inevitable, and the future feels less like hope than a reckoning. Red Bike is the first play produced by Simpatico Theatre under its new Artistic Director, Allison Heishman. It is also part of their recently adopted Pay What You Decide ticketing structure. Designed to make theatre more accessible for everyone, PWYD means that there is no upfront cost for someone to attend a performance. Instead, you are given a blank envelope with your program and, once the play is finished, you can decide how much the experience was worth, or how much you are able to pay for it. This is an idea Simpatico has borrowed from the Azuka Theatre, and is an impressive step toward making culture and theatre more accessible for everyone. It also means there is no reason for you not to make a reservation and check out Red Bike for yourself. Red Bike runs through June 24th, and you can reserve your tickets online.